In the 3rd century A.C. the hieroglyphic writing was not very well known and even 800 years before, the „strangers“ from outside Egypt (e.g. 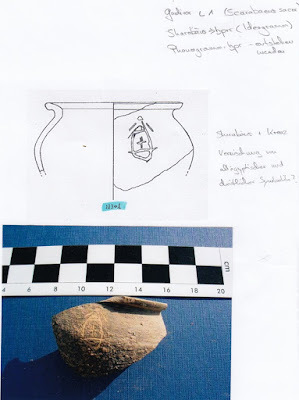 the Phoenicians and others) could not understand the meaning and used the signs as decoration on vessels. 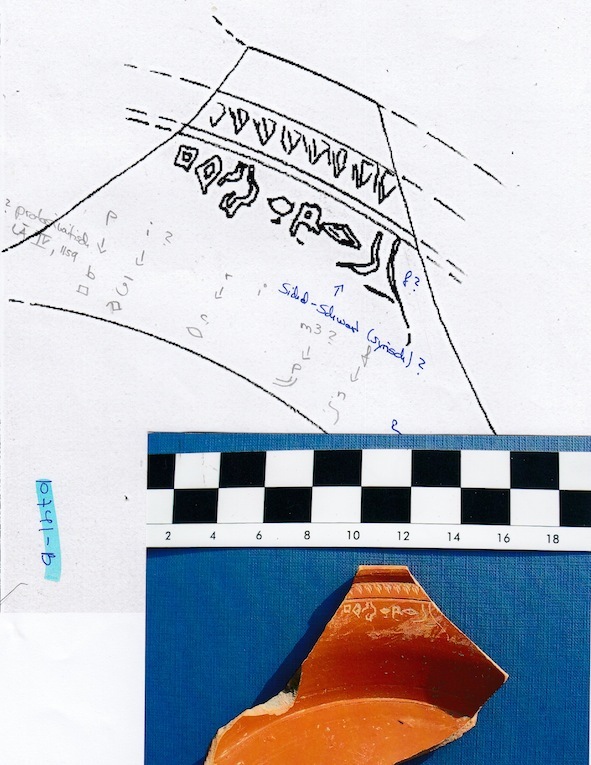 The inscription on a Phoenician kotyle from the 6th century B.C. found near Salerno at Pontecagnano shows hieroglyphs without meaning (2, fig. C). 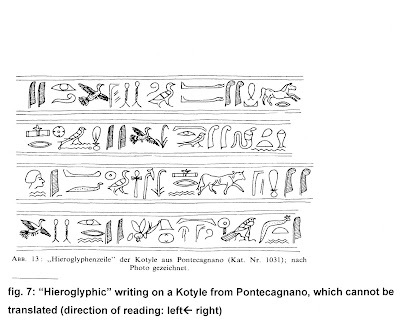 The signs can be identified as ancient Egyptian hieroglyphs (3) but they cannot be translated. Very well done, they are used as decoration on the kotyle. 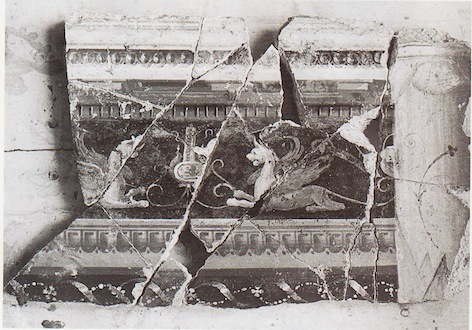 On IR 11413 (fig. 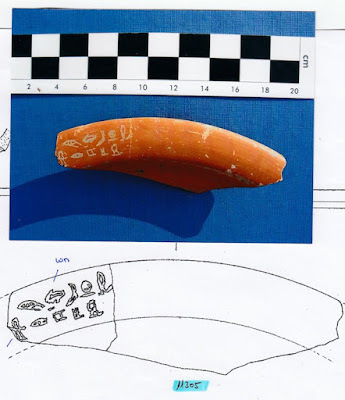 D) you can see an Egyptian cartouche/stamp with hieroglyphs on a pottery fragment. In Ancient Egyptian times cartouches were used for the royal names, which were written in hieroglyphs inside the stamp. You can find such cartouches as „possessing signs“ on the walls of Egyptian buildings and tombs, on statues, vessels and so on. 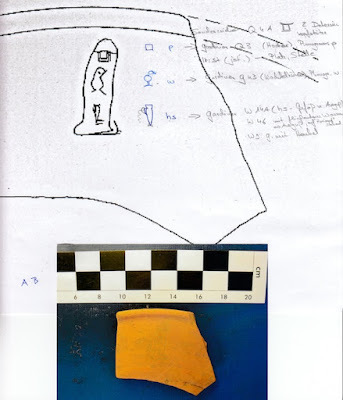 In Roman times the cartouche often contains the inscription „per-aa“, Pharao - translated as „Important House“ without name (4) or the cartouche was without any inscription (5) - only a symbol . 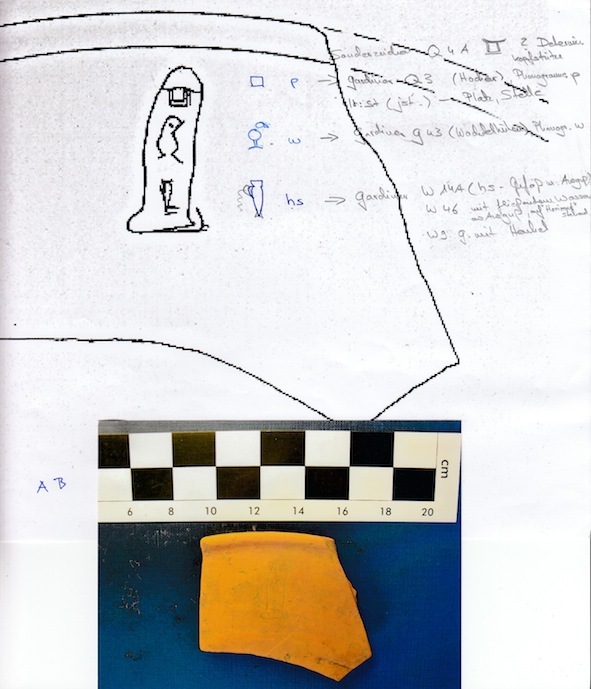 At piece IR 11413 appears a so called pseudo-cartouche, because the hieroglyphs have no meaning as a name, maybe they are also used in a decorative way or as a symbol. On a Phoenician silver vessel from the 6th century B.C. we recognize a lot of „Egyptian themes“, e.g. 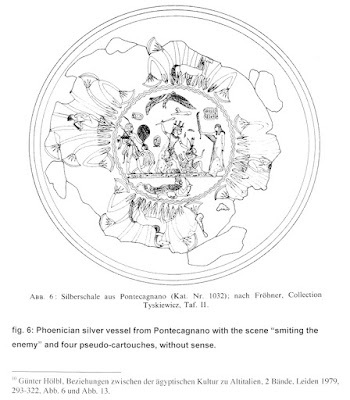 the pharao smites the enemy in front of a god, the young god Horus on a lotus-flower and four cartouches (6, fig. E). Inside the cartouches there are written hieroglyphs without sense. 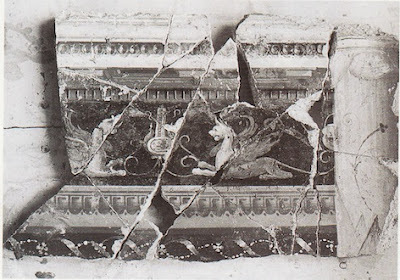 The Ancient Egyptian scenes can be found on temples all over Egypt and the cartouches symbolize the King, the Pharao – even the name cannot be read. And in this case a lot of Ancient Egyptian „relics“ were used later, mainly as decoration or symbols. Augustus conquered Egypt in the year 30 B.C as Octavian and this was the beginning of „Egyptomania“ in the Roman Empire. 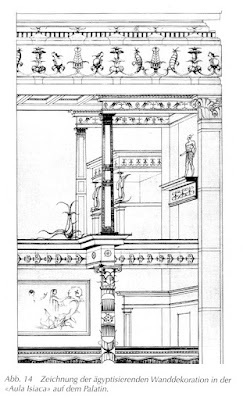 Up to the 4th century A.C. it was en vogue to use Egyptianizing elements, especially in the private properties of the nobles (e.g. 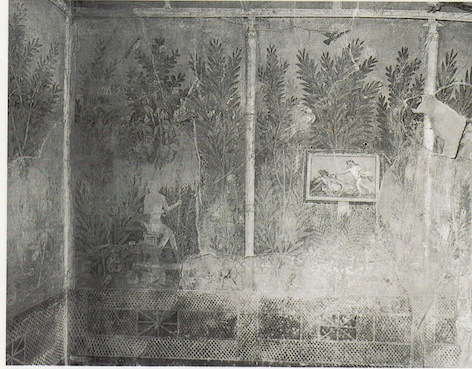 Domus Livia and Aula Isiaca, both at the Palatine/Rome; Domus Loreius Tiburtinus/Pompeii). 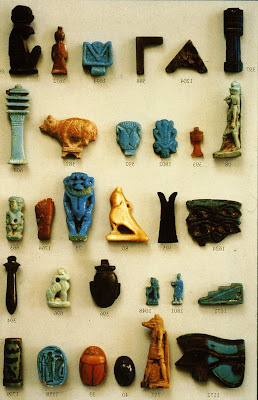 In the Getty Museum in Malibu there is a small bottle of Cameoglass with Egyptianizing decoration from Augustean time. The image represents different Egyptian motives like the ibis, the snake and an obelisk with senseless hieroglyphs (7, fig. F). 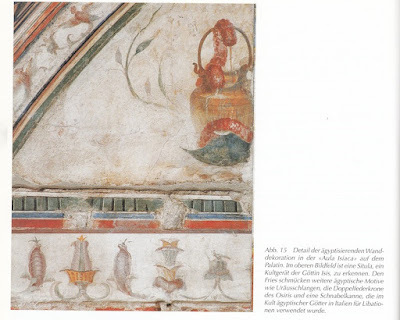 In these examples the hieroglyphic writing, which cannot be translated, is used as decoration. 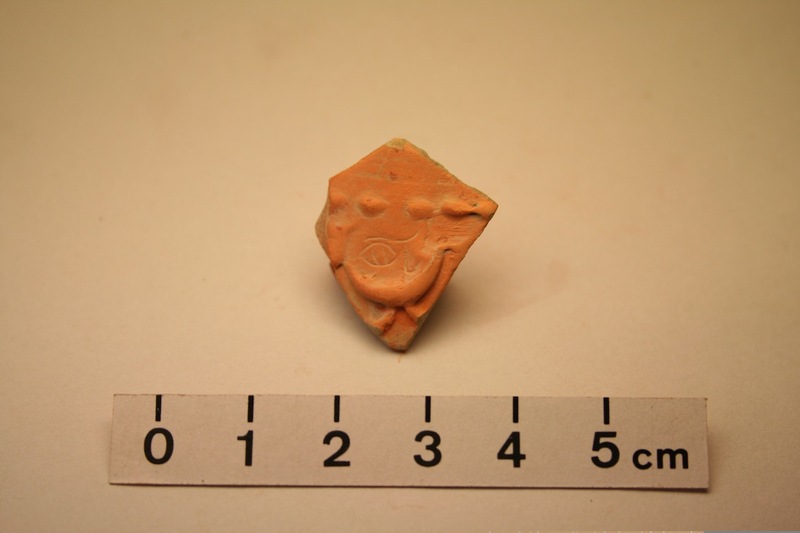 Other Egyptologists are not of the same opinion and have doubts about the authenticity of the finds (8). 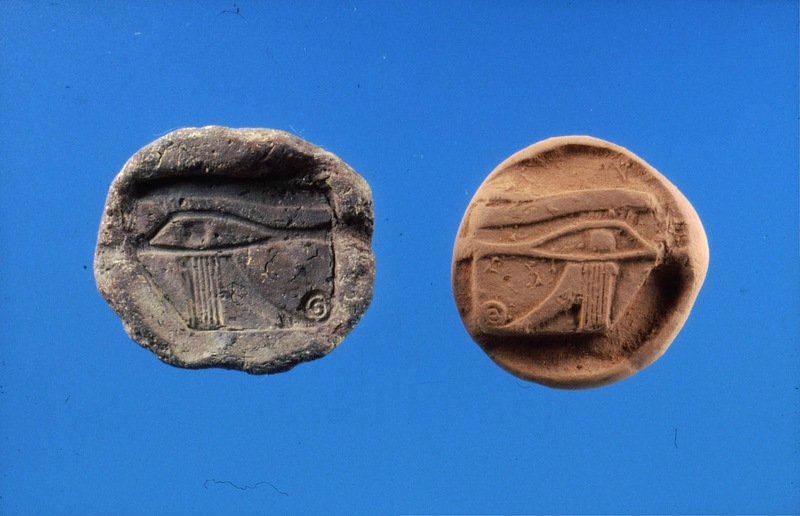 In Iruña-Veleia there are three pieces with important Ancient Egyptian motives, the Udjat-eye and the scarab. IR 10828 (fig. 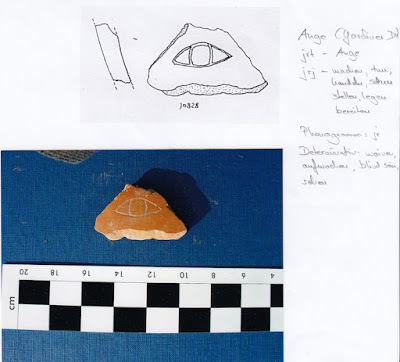 G) shows an eye (Gardiner D4) which was used as phonogram jr „to see“ or as ideogram jr.t „eye“ and jrj „to do, to make, to place, to put, to work out.“ It was also used as determinative for „to see, to cry, to wake up, to be blind“ (9). IR 16718 (fig. H) figures out the Udjat-eye (Gardiner D10). It is the determinative for „eye, wd3t/Udjat-eye“ and standing for the tutelary god Horus. 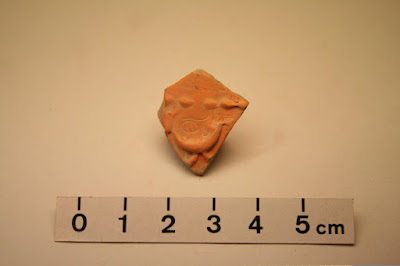 Used as sign against bad influences and as amulet for protection. We find it also in an ornamental way (10, fig. I,J). 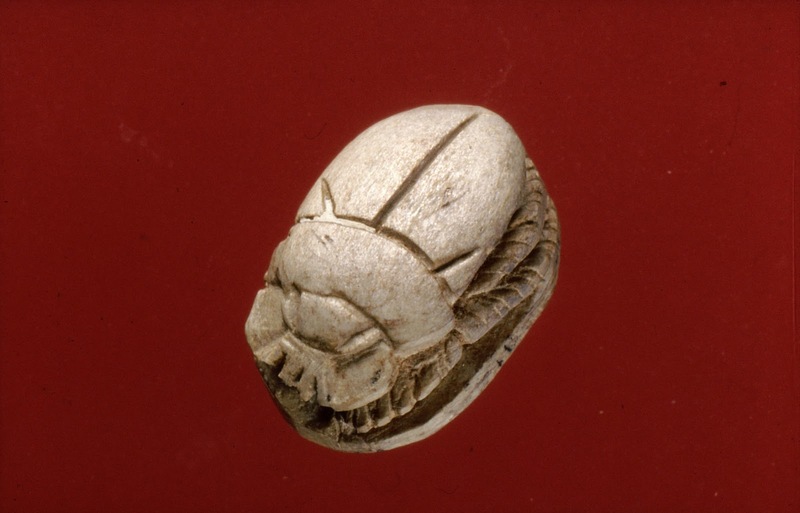 The scarab/scarabeus sacer (Gardiner L1) on IR 11301 (fig. 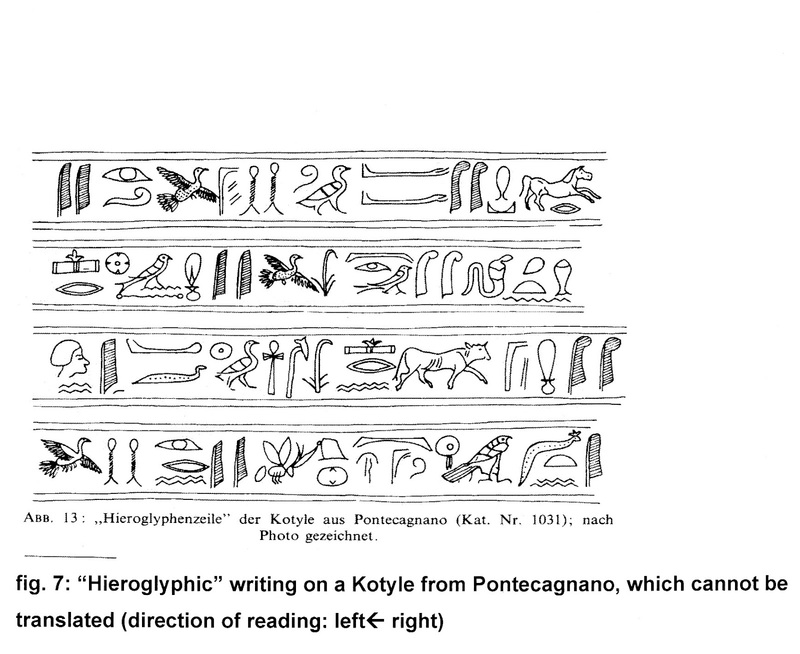 K) is the phonogram hpr „come into, begin, be created be formed, arise, develop, to grow“ and as ideogram hppr for „scarab, the god Chepri as sun in the morning). The scarab was also used as amulet (11, fig. L). The Egyptian motives are handed down to the Roman World and at the Aula Isiaca, Palatine Hill in Rome, and at other private properties or residences Egyptianizing decoration can be found (10,11,12,13; fig. M,N,O,P). 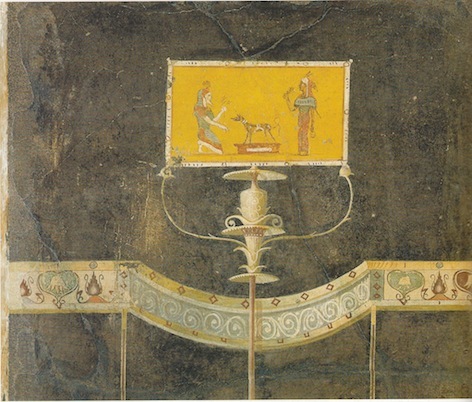 Underneath the Vesuvius volcano and in Pompeii, e.g. 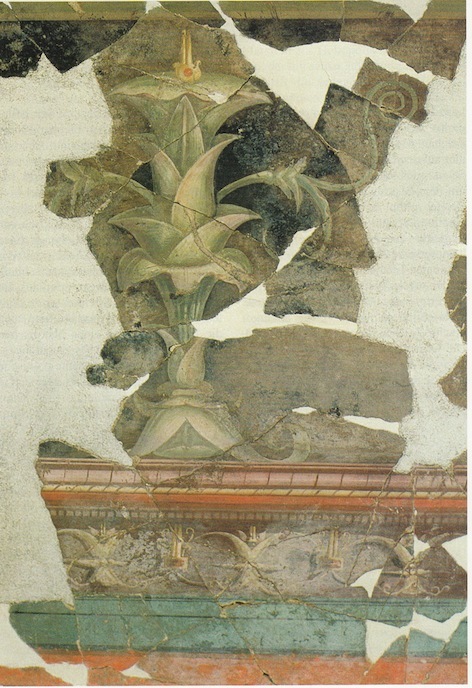 at the Domus Loreius Tiburtinus, there are a lot of Egyptianizing elements (14,15,16; fig. Q,R,S,T). 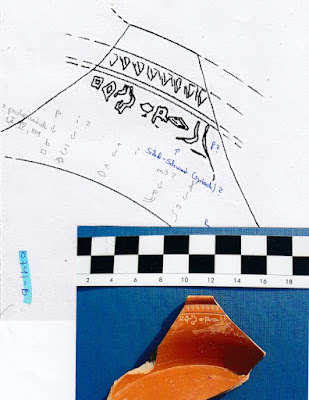 1) Fritz, U. Egyptomania in the Roman Empire – The ostraca with Egyptianizing hieroglyphs of Iruna-Veleia and pieces of bone with Egyptian gods in Latin. 2016. Fritz, U. 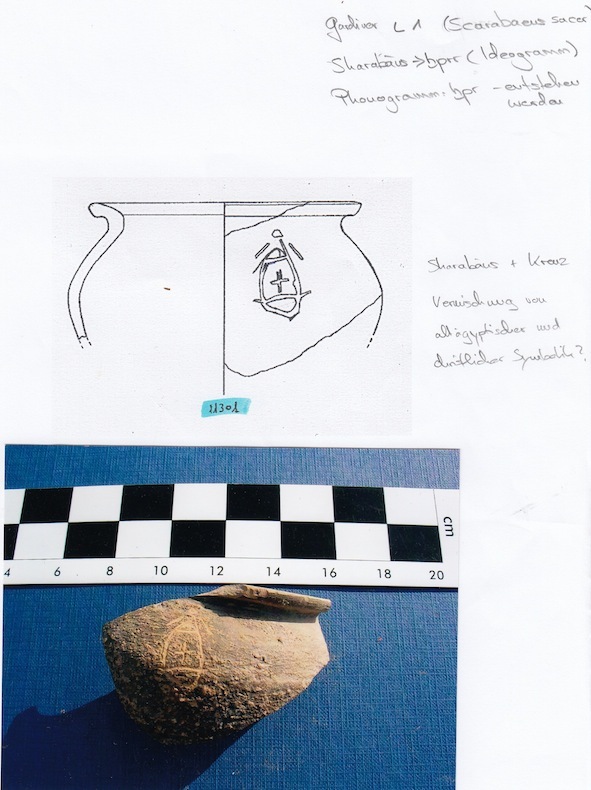 Report about the ostraka with Egyptianizing hieroglyphs and Egyptian names written in Latin on bone or on ostrakon of Iruna-Veleia. 2008. 10) Zibelius-Chen, C. Das Alte Ägypten, Museum Schloß Hohentübingen. 2002. Abb. S. 74 (amulets) MUT div. 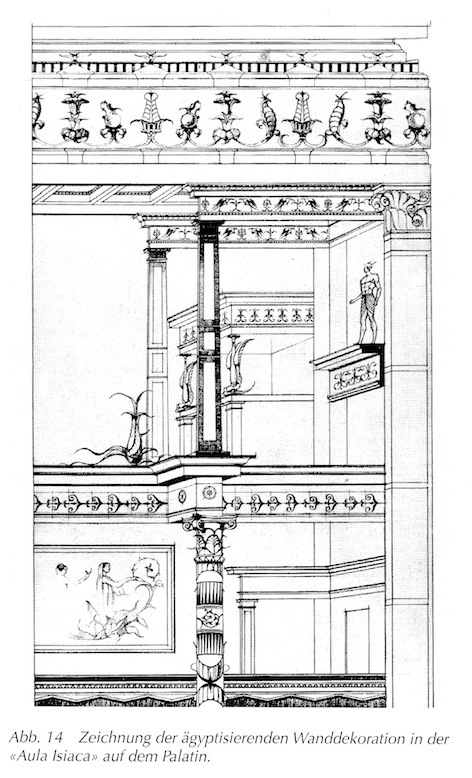 Inv; S. 76, Abb. links unten (model) MUT Inv. 1161.